The National Park Service and CyArk are extremely excited to kick off the new year with the launch of the much anticipated Mount Rushmore Website, a new way to virtually visit the National Memorial near Keystone, South Dakota. This web portal is part of an ongoing partnership between the National Park Service and CyArk, and it will be continually added to as more media is created over the upcoming months. The Mount Rushmore National Memorial is host to almost three million visitors a year from across the country and around the world. Over the decades, Mount Rushmore has grown as a symbol of America - a symbol of freedom and hope for people from all cultures and backgrounds. In May of 2010, the NPS collaborated with the Kacyra Family Foundation and CyArk, and a Scottish Team from the Centre for Digital Documentation and Visualisation (a partnership between Historic Scotland and the Glasgow School of Art) to digitally preserve Mount Rushmore. CyArk founder, Ben Kacyra, said: “It is an honor for our organization to digitally preserve such an important monument to the American spirit for generations to come. 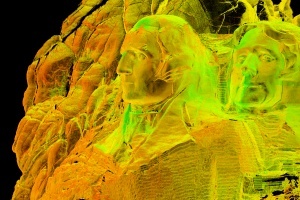 The CyArk website gives free access to users across the globe, allowing them to experience Mount Rushmore alongside other culturally significant world heritage sites.” The laser scanning project also owes its success to the important contributions from Respec Engineering, and Wyss and Associates, who worked to develop a geo-referenced control network that was used to tie all the laser scan data together. Doug Pritchard, Head of Visualisation at the GSA’s Digital Design Studio, said: “The documentation of the Mount Rushmore National Monument was a tremendous privilege, in particular working with the local survey organisations, Leica Geosystems, the US Parks Ropes Team and CyArk." One of the first digital documentation projects on such a scale, it was a momentous collaboration for all the project partners. For the Scottish partners, Mount Rushmore was the first of five international heritage sites to get laser scanned as a part of their Scottish Ten initiative. Scottish Cabinet Secretary of Culture and External Affairs Fiona Hyslop said: “I am really thrilled that the work done by the Scottish Ten team is being used in such a wonderful way. Mount Rushmore was the first international site that the Scottish Ten project tackled and I know that it is still regarded as setting the bar really high in the standard of the work being carried out and the innovation in getting all of the data required." The entire sculpture and majority of the public park grounds were laser scanned and photographed to capture the Memorial and create a highly-accurate digital model. The digital information gathered is being used to create media for physical preservation work, education, and virtual tourism. “With this innovative web portal, internet users around the world will be able to remotely access the Memorial, whether it is to plan a visit or to virtually explore unusual areas such as the Hall of Records,” said Mount Rushmore Superintendent Cheryl Schreier. From the project's main page, users have access to an array of rich multimedia including an interactive virtual tour of the park, navigable and measurable “point cloud” models, and a large collection of current-day and historic photographs (some of which were never before released to the public). The web portal is only the beginning of an ongoing partnership between NPS and CyArk. Upcoming releases will include an on-site exhibit at the Lincoln Borglum Visitor Center where visitors can learn about the digital preservation process, see the equipment used as part of the laser scanning project, and explore the virtual tour and digital archive. In addition, a collection of ten K-12 lesson plans will be available for download and use in the classroom. These lesson plans were developed during an education workshop bringing together the expertise of local high school math and art educators, NPS, and CyArk. Stay tuned for an update blog when the lesson plans become available online by registering for the CyArk Newsletter or following us on Twitter and Facebook! Please Click for PDF's of the official Press Releases from the National Park Service and Historic Scotland and Glasgow School of Art. 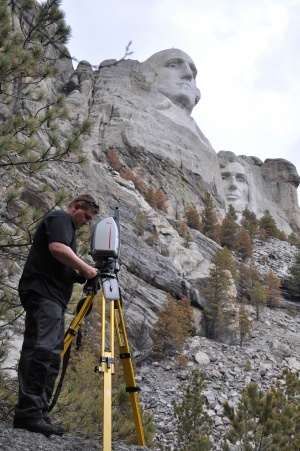 The terrestrial laser scanners used by the scanning team capture millions of data points to create a dense point cloud rendering of the entire mountain sculpture at Mount Rushmore National Memorial. Al Rawlinson from the Glasgow School of Art prepares the Leica Scanstation 2 to scan Mount Rushmore National Memorial. Photo by Amy Bracewell, NPS. 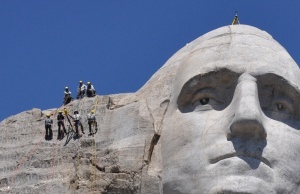 The technical ropes team at Mount Rushmore National Memorial prepare a custom made tripod used on the sculpture to capture accurate scanning data of the faces. Photo by Amy Bracewell, NPS.